General Motors Holden, generally known as Holden, is an American automobile manufacturer that operates in Australia and is headquartered in Port Melbourne, Victoria. The company was founded in 1856 as a saddlery manufacturer in South Australia. In 1908 it moved into the automotive field, before becoming a subsidiary of the United States-based General Motors (GM) in 1931. After becoming a subsidiary of GM, the company was named General Motors-Holden's Ltd, becoming Holden Ltd in 1998—the current name was adopted in 2005. Holden offers the locally produced range of Commodore vehicles, supplemented by imported GM models. Holden has offered the following badge engineered models in sharing arrangements: Chevrolet, Isuzu, Nissan, Opel, Suzuki, Toyota and Vauxhall Motors. As of 2013, the vehicle lineup consists of models from GM Korea, GM Thailand, GM in the US, and self-developed Commodore, Caprice, and Ute. Holden also distributed the European Opel brand in Australia in 2012 until the brand's Australian demise in mid-2013. All Australian-built Holden vehicles are manufactured at Elizabeth, South Australia, and engines are produced at the Fishermans Bend plant in Port Melbourne, Victoria. Historically, production or assembly plants were operated in all mainland states of Australia, with GM's New Zealand subsidiary Holden New Zealand operating a plant until 1990. The consolidation of car production at Elizabeth was completed in 1988, but some assembly operations continued at Dandenong until 1994. Although Holden's involvement in exports has fluctuated since the 1950s, the declining sales of large cars in Australia have led the company to look to international markets to increase profitability. On 11 December 2013, Holden announced that it will cease vehicle and engine production by the end of 2017, however, the company will continue to have a large and ongoing presence in Australia importing and selling cars as national sales company. Holden will retain their design centre, but with reduced staffing. In the last few years, Holden incurred losses due to the strong Australian dollar, with government grants being reduced in future. In May 2014 GM reversed their decision to abandon the Lang Lang Proving Ground and have decided to keep it as part of their engineering capability in Australia. By 1923, HMBB were producing 12,000 units per year. During this time, HMBB was the first company to assemble bodies for Ford Australia until their Geelong plant was completed. From 1924, HMBB became the exclusive supplier of car bodies for GM in Australia, with manufacturing taking place at the new Woodville, South Australia, plant. These bodies were made to suit a number of chassis imported from manufacturers such as Chevrolet and Dodge. In 1926 General Motors (Australia) was established with assembly plants at Newstead, Queensland; Marrickville, New South Wales; City Road, Melbourne, Victoria; Birkenhead, South Australia; and Cottesloe, Western Australia utilising bodies produced by Holden Motor Body Builders and imported complete knock down (CKD) chassis. In 1930 alone, the still independent Woodville plant built bodies for Austin, Chrysler, DeSoto, Morris, Hillman, Humber, Hupmobile and Willys-Overland as well GM cars. The last of this line of business was the assembly of Hillman Minx sedans in 1948. The Great Depression led to a substantial downturn in production by Holden, from 34,000 units annually in 1930 to just 1,651 units one year later. In 1931 General Motors purchased Holden Motor Body Builders and merged it with General Motors (Australia) Pty Ltd to form General Motors-Holden's Ltd (GM-H). Throughout the 1920s Holden also supplied tramcars to Melbourne and Metropolitan Tramways Board. Several have been preserved in both Australia and New Zealand. Holden's next model, the FE, launched in 1956; offered in a new station wagon body style dubbed "Station Sedan" in the company's sales literature. In the same year Holden commenced exports to Malaya, Thailand and North Borneo. Strong sales continued in Australia, and Holden achieved a market share of more than 50 percent in 1958 with the revised FC model. This was the first Holden to be tested on the new Holden Proving Ground based in Lang Lang, Victoria. 1957 saw Holden's export markets grow to 17 countries, with new additions including Indonesia, Hong Kong, Singapore, Fiji, Sudan, the East Africa region and South Africa. The opening of the Dandenong, Victoria, production facility in 1956 brought further jobs; by 1959 Holden employed 19,000 workers country-wide. In 1959 complete knock down assembly began in South Africa and Indonesia. The UC, Holden's final iteration of the Torana was replaced by an interim four-cylinder version of the Commodore until Camira launched in 1982. During the 1970s, Holden ran an advertising jingle "Football, Meat Pies, Kangaroos and Holden cars", based on the "Baseball, Hot Dogs, Apple Pies and Chevrolet" jingle used by Chevrolet in the United States. Also, development of the Torana continued in with the larger mid-sized LH series released in 1974, offered only as a four-door sedan. The LH Torana was one of the few cars worldwide engineered to occupy four-, six-and eight-cylinder engines. This trend continued until Holden introduced the Sunbird in 1976; essentially the four-cylinder Torana with a new name. Designated LX, both the Sunbird and Torana introduced a three-door hatchback variant. A final UC update appeared in 1978. During its production run, the Torana achieved legendary racing success in Australia, achieving victories at the Mount Panorama Circuit in Bathurst, New South Wales. In December 2015, Belgian entrepreneur Guido Dumarey commenced negotiations to buy the Commodore manufacturing plant in South Australia, with a view to continue producing a rebadged Zeta-based premium range of rear and all-wheel drive vehicles for local and export sales. The proposal was met with doubt in South Australia, and it later came to nothing. As of 8 May 2015, Jeff Rolfs, Holden's CFO, is interim chairman and managing director. Holden announced on 6 February 2015 that Mark Bernhard would return to Holden as chairman and managing director, the first Australian to hold the post in 25 years. Vehicles are sold countrywide through the Holden Dealer Network (310 authorised stores and 12 service centres), which employs more than 13,500 people. In 1987, Holden Special Vehicles (HSV) was formed in partnership with Tom Walkinshaw, who primarily manufactures modified, high-performance Commodore variants. To further reinforce the brand, HSV introduced the HSV Dealer Team into the V8 Supercar fold in 2005 under the naming rights of Toll HSV Dealer Team. Holden began to export vehicles in 1954, sending the FJ to New Zealand. Exports to New Zealand have continued ever since, but to broaden their export potential, Holden began to cater their Commodore, Monaro and Statesman/Caprice models for both right- and left-hand drive markets. 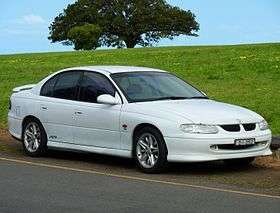 The Middle East is now Holden's largest export market, with the Commodore sold as the Chevrolet Lumina since 1998, and the Statesman since 1999 as the Chevrolet Caprice. Commodores are also sold as the Chevrolet Lumina in Brunei, Fiji and South Africa, and as the Chevrolet Omega in Brazil. Pontiac in North America also imported Commodore sedans from 2008 through to 2009 as the G8. However, Pontiac went bankrupt in late 2009 and GM had to shut down Pontiac in 2010. The G8's cessation was a consequence of GM's Chapter 11 bankruptcy resulting in the demise of the Pontiac brand. Holden has been involved with factory backed teams in Australian touring car racing since 1968. The main factory-backed teams have been the Holden Dealer Team (1969–1987) and the Holden Racing Team (1990–2016). Holden has won the Bathurst 1000 thirty times, more than any other manufacturer, and has won the Australian Touring Car and Supercars Championship title nineteen times. Along with the Holden Racing Team, Holden also supports Triple Eight Race Engineering in Supercars, while Brad Jones Racing, Britek Motorsport, Charlie Schwerkolt Racing, Erebus Motorsport, Lucas Dumbrell Motorsport and Tekno Autosports run Holden Commodores in the series. ↑ Campbell, Matt (2 August 2013). "Opel Australia shuts its doors". Drive. Retrieved 26 August 2013. ↑ "Holden to cease local production in 2017". AUSmotive.com. 11 December 2013. Retrieved 11 December 2013. ↑ "Holden exits engineering". GoAuto. 12 December 2013. Retrieved 10 March 2015. ↑ "GM's Holden to stop making cars in Australia". BBC News. 11 December 2013. ↑ "Coalition government welcomes Holden's announcement that Long Lang Providing Ground to be retained". premier.vic.gov.au. May 2014. Retrieved 10 March 2015. ↑ "Street name" (DOC). City of Burnside. Retrieved 3 June 2009. ↑ Davis, Kennedy, Kennedy (2007): Part One, p. 16. ↑ Davis, Kennedy, Kennedy (1998): p. 7. ↑ "James Alexander Holden family papers, 1801–1975". State Library of New South Wales. Archived from the original on 19 July 2011. ↑ Hancock, Joan; Richards, Eric. "Holden, Sir Edward Wheewall (1885–1947)". Australian Dictionary of Biography. Melbourne University Publishing. Retrieved 23 August 2008. 1 2 3 4 "Holden History". Unique Cars and Parts. Retrieved 23 August 2008. 1 2 3 4 5 6 7 8 9 "Milestones". General Motors. Archived from the original on 22 March 2008. Retrieved 18 March 2010. ↑ Darwin (2002), p. 3. ↑ "Submission to Automotive Enquiry" (PDF). Productivity Commission. Government of Australia. Retrieved 17 July 2008. 1 2 "The Holden car in Australia". Government of Australia. Retrieved 23 August 2008. ↑ Darwin (2002), p. 7. ↑ Darwin (2002), p. 4. ↑ Sedgwick, Michael (1975). Cars of the Thirties and Forties. London: Hamlyn. p. 187. ISBN 0600321487. ↑ "The Holden Ute History". Holden New Zealand. 22 August 2007. Retrieved 26 February 2008. 1 2 "Road transport". National Archives of Australia. Archived from the original on 25 October 2005. ↑ Grant, Tina, ed. (2004). "Holden Ltd.". International Directory of Company Histories. 62. Thomson Gale. Retrieved 28 February 2008. ↑ Russell, Rohan. "The Oldsmobile "ACE" – 1946 to 1948". Gladstone Park, Victoria: Oldsmobile Club of Australia. Retrieved 8 June 2010. ↑ Loffler (2006), p. 5–7. ↑ Loffler (2000), p. 5. ↑ Balderstone, Bowan, Lewis (2006), p. 184–188. ↑ "The Birth of 'Australia's Own Car'". GM Holden. Archived from the original on 23 July 2008. Retrieved 5 March 2008. ↑ "Holden Prototype Car No. 1". National Museum of Australia. Retrieved 6 April 2011. ↑ "Holden – General Motors new Australian car" (PDF). General Motors–Holden's. 1948. Retrieved 2 March 2008. ↑ Loffler (2002), p. 4. ↑ Davis, Kennedy, Kennedy (2007): Part One, p. 38. ↑ "An Aussie Icon Turns 50 – The Holden Ute: 1951 – 2001". AutoWeb. Web Publications. 24 April 2001. Retrieved 23 August 2008. ↑ Davis, Kennedy, Kennedy (2007): Part One, p. 40. ↑ Bebbington (1998), p. 14. "...the FJ was easily identified by its bold new, Buick-style grille, new hubcaps and new torpedo-style tail-lights." ↑ Loffler (2002), p. 5. 1 2 3 4 5 6 7 8 "Aussies Overseas". MotoringOrient.com. Retrieved 6 October 2011. 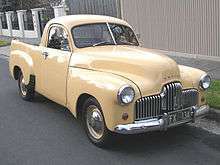 ↑ "FJ Holden, 1953–1956". National Museum of Australia. Retrieved 4 March 2008. ↑ Carey (2005), p. 16. ↑ "Golden Holden Oldies – The FE Holden: 1956". AutoWeb. Web Publications. 24 March 1998. Retrieved 6 March 2008. ↑ Wright (1998), p. 117. ↑ "Holden's Lang Lang Proving Ground Passes Forty-Year Milestone". AutoWeb. Web Publications. 14 October 1997. Retrieved 6 March 2008. ↑ "The New Blokes". The Times. 2 November 1959. Retrieved 23 August 2008. ↑ Wright (1998), p. 122. ↑ Davis, Kennedy, Kennedy (2007): Part One, p. 46. ↑ Wright (1998), p. 133–134. ↑ Davis, Kennedy, Kennedy (2007): Part One, p. 48. ↑ Wright (1998), p. 135. ↑ "Holden 6 Cylinder Red Motor". Unique Cars and Parts. Retrieved 23 August 2008. ↑ Davis, Kennedy, Kennedy (2007): Part One, p. 54. ↑ "Holden HD". Unique Cars and Parts. Retrieved 24 January 2009. ↑ Davis, Kennedy, Kennedy (2007): Part Two, p. 57. ↑ "Holden Torana HB". Unique Cars and Parts. Retrieved 6 March 2008. ↑ Wright (1998), p. 191–192. 1 2 Bebbington (1998), p. 103. "Also introduced on the LC was the Tri-matic automatic transmission. This was GM-H's own three-speed unit." ↑ Davis, Kennedy, Kennedy (2007): Part One, p. 5, 31. ↑ Davis, Kennedy, Kennedy (2007): Part Two, p. 59. ↑ Davis (1987), p. 102. ↑ Wright (1998), p. 171. ↑ Autocar (1969), p. 62. ↑ Wright (1998), p. 137. "The millionth Holden, a Eura Gold EJ Premier sedan, passing down the Dandenong production line on 25 October 1962." ↑ "Holden Employees Farewell The Last Aussie-Built V8". AutoWeb. Web Publications. 28 June 1999. Retrieved 5 March 2008. ↑ Bebbington (1998), p. 36. "Tri-matic automatic transmission replaced Powerglide late in the [HT] model run (May '70) (except [Monaro GTS] 350)." ↑ Bebbington (1998), p. 38. "[The HG signified] the official introduction of the Tri-matic three-speed automatic transmission to the full-size car range." ↑ Davis, Kennedy, Kennedy (2007): Part One, p. 31. 1 2 Strauss (1998), p. 11. ↑ "Golden Holden Oldies – Stars of the Seventies". AutoWeb. Web Publications. 26 October 1998. Retrieved 5 March 2008. ↑ "Car review – Holden Statesman V6 sedan". GoAuto. Retrieved 5 March 2008. ↑ Luck (1971), p. 62. ↑ Davis, Kennedy, Kennedy (2007): Part Two, p. 67–68. ↑ Wright (1998), p. 226. ↑ Wright (1998), p. 340–341. ↑ Wright (1998), p. 239–241. ↑ "Mazda Roadpacer". Unique Cars and Parts. Retrieved 21 April 2009. ↑ McCarthy (2007), p. 142. "...a faction within General Motors had a serious case of the hots for Dr Wankel's rotary engine. [...] The Premier, in all its glory (except drivetrain), was shipped to Hiroshima where Mazda partially fitted the empty engine bay with a 13B rotor motor, backed by a three-speed auto. [...] Production lasted just two years and 840 units...". ↑ King, Philip (16 August 2008). "Cars at a fork in the road". The Australian. Retrieved 19 November 2008. 1 2 3 Wright (1998), p. 340. ↑ Wright (1998), p. 198. ↑ Wright (1998), p. 244. ↑ Bebbington (1998), p. 115. ↑ "Golden Holden Oldies – The Holden Torana (1967–78) – A Bathurst Legacy". AutoWeb. Web Publications. 4 November 1998. Retrieved 9 June 2008. ↑ "Holden Gemini TX". Unique Cars and Parts. Retrieved 23 August 2008. ↑ "Holden Gemini RB". Unique Cars and Parts. Retrieved 23 August 2008. ↑ Tuckey (1999), p. 27. ↑ Tuckey (1999), p. 33. 1 2 Robinson (2006), p. 23, 26–27. 1 2 Robinson (2006), p. 24. ↑ Wright (1998), p. 277. ↑ Davis, Kennedy, Kennedy (2007): Part Two, p. 82. ↑ Davis, Kennedy, Kennedy (2007): Part Two, p. 87, 95. ↑ "Reborn!" (1985), p. 19. "We have been waiting a long time for this front wheel drive replacement for the original Gemini. The Isuzu people have not exactly been speedy signing off the development for the RB, or what has been known as the R-car...". ↑ Mullett, Chris (May 1982). "Intertruck: Australia". TRUCK. London, UK: FF Publishing Ltd. p. 36. ↑ Kenwright, Joe (29 July 2006). "Crossing the Lion". Carsales. Retrieved 16 June 2007. ↑ Robinson (2006), p. 26. ↑ Davis, Kennedy, Kennedy (2007): Part Two, p. 89–94. ↑ Cropley, Steve, ed. (September 1984). "Oracle: Headlines". Car. London, UK: FF Publishing. p. 9. ↑ "Caring for our air". State of Queensland. 21 June 2007. Archived from the original on 13 December 2009. Retrieved 23 August 2008. ↑ Robinson (2006), p. 25. 1 2 3 Robinson (2006), p. 27. "...on 19 December 1986 GM paid off Holden's accumulated losses of around A$780m, leaving the company free of debt. This was a new beginning, but GM insisted the company be split in two..."
↑ Davis, Davis (1988), p. 91. "In December 1986, GM-H announced a major restructure of its activities replacing the existing General Motors-Holden's Ltd with two sister firms, Holden's Motor Company (HMC) and Holden's Engine Company (HEC)." ↑ "Holden Reaches Golden Milestone With 50 Years of Exports". AutoWeb. Web Publications. 9 November 2004. Retrieved 23 August 2008. ↑ Davis, Kennedy, Kennedy (2007): Part Two, p. 91. ↑ Earl (2002), p. 29. ↑ Earl (2002), p. 27–28. 1 2 "Sales and Share of Australian Market Archive (1991–2002)". General Motors. Archived from the original on 29 August 2007. Retrieved 23 August 2008. ↑ "GM Global Operations: Australia". General Motors. Archived from the original on 27 April 2007. ↑ Davis, Kennedy, Kennedy (2007): Part One, p. 9. ↑ "Heart of Holden – Holden Heritage". Holden New Zealand. Archived from the original on 1 June 2008. Retrieved 23 August 2008. ↑ Richardson, Michael (24 April 1997). "Automakers Say Cuts in Duties Would Maim Industry : Tussle on Tariffs in Australia". International Herald Tribune. Retrieved 23 August 2008. ↑ Wright (1998), p. 343. ↑ Davis, Kennedy, Kennedy (2007): Part Two, p. 103–104. ↑ Robinson (2006), p. 26–27. ↑ Smith, Graham (6 September 2002). "1993 Holden VR Commodore". Herald Sun. Retrieved 2 March 2008. ↑ McCarthy, McKay, Newton, Robinson (2006), p. 158. ↑ Davis, Kennedy, Kennedy (2007): Part Three, p. 11. ↑ "Car review – Holden Nova 5-dr hatch". GoAuto. Retrieved 23 August 2008. ↑ Fujimoto, Takahiro (October 1998). "Toyota Motor Manufacturing Australia in 1995: An Emergent Global Strategy". University of Tokyo. p. 23. Archived from the original (PDF) on 19 March 2011. ↑ "Car review – Holden Barina Swing 5-dr hatch". GoAuto. Retrieved 23 August 2008. ↑ "Car review – Holden Suburban 1500 LT 5-dr wagon". GoAuto. 10 May 2001. Retrieved 22 April 2009. 1 2 "Holden Announces Next Stage Of $1 Billion Export Drive". AutoWeb. Web Publications. 8 September 1999. Retrieved 23 August 2008. ↑ Davis, Kennedy, Kennedy (2007): Part One, p. 34. ↑ Kennedy, Ewan (18 June 2005). 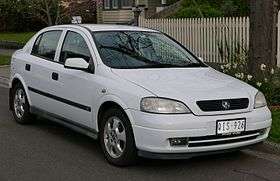 "Holden Vectra 1997–2004". Marque Publishing. Retrieved 5 March 2008. ↑ "Sales and Share of Australian Market (2003–present)". General Motors. Archived from the original on 7 August 2007. Retrieved 23 August 2008. ↑ "Number Crunching" (2003), p. 181. ↑ "Holden Posts $146 Million Loss". CarAdvice. 18 June 2007. Retrieved 23 August 2008. ↑ "Mitsubishi to cut more jobs". The Age. Melbourne. 20 January 2006. Retrieved 23 August 2008. ↑ Pettendy, Marton (30 July 2008). "GM Holden posts a $6 million loss for 2007 as domestic and export sales slow". GoAuto. Retrieved 30 July 2008. ↑ McDonald, Neil (26 June 2009). "Holden posts $70m loss in Australia". The Sun-Herald. Retrieved 26 June 2009. ↑ Hammerton, Ron (13 April 2011). "Red team back in black". GoAuto. Retrieved 13 April 2011. ↑ "Holden Unveils New Headquarters in Port Melbourne". Next Car. 19 May 2005. Retrieved 28 September 2010. ↑ Dowling (2003), p. 151. "[Holden] planned to build about 7,500 coupes in total for the Australian market [per year] and we were looking at building another 18,000 to 20,000 a year." ↑ "Holden employee pricing backfires". Australian Competition and Consumer Commission. 19 April 2006. Retrieved 28 January 2008. ↑ "Holden Waves Goodbye to Monaro". WebWombat. 21 July 2005. Retrieved 23 August 2008. ↑ McCarthy, McKay, Newton, Robinson (2006), p. 159. ↑ "Premier Opens New Holden Engine Plant". State of Victoria. 5 November 2003. Archived from the original on 31 May 2004. ↑ Robinson (2006), p. 34–35, 55–56. ↑ "Spanner in the works". Drive. 1 February 2005. Retrieved 23 August 2008. 1 2 Gratton, Ken (2 November 2009). "GM to take larger stake in Daewoo". Carsales. Retrieved 20 October 2010. ↑ Hassal, David (7 April 2009). "GM Daewoo seeks vital cash". GoAuto. Retrieved 20 October 2010. ↑ "Update 1-GM buys all new shares in S.Korea unit". Reuters. 23 October 2009. Retrieved 20 October 2010. ↑ Carey (2005), p. 131. ↑ Carey (2005), p. 128–129. ↑ Ponchard (2006), p. 106–112. ↑ Newton (2007), p. 104–108. ↑ Stanford, James (1 July 2008). "Colorado cuts loose". GoAuto. Retrieved 4 July 2008. ↑ Toby, Hagon (27 February 2009). "Holden Cruze missiles to Australia". Retrieved 27 February 2009. ↑ Stanford, James (12 January 2010). "Holden confirms Cruze delay". GoAuto. Retrieved 16 April 2010. ↑ Kerin, Paul (17 March 2009). "Rudd has made it too easy". The Australian. Retrieved 17 March 2009. ↑ "Holden To Stay After Government Promises $270 Million Assistance". Australian Manufacturing. 23 March 2012. Retrieved 10 February 2014. ↑ Philip Martin; Sarah King (11 July 2013). "Holden plays double or nothing: $265m or closure". The Australian. Retrieved 11 July 2013. ↑ "Holden workers vote to accept three-year wage freeze". ABC News. 14 August 2013. Retrieved 17 August 2013. 1 2 "Holden announces it will cease manufacturing operations in Australia by 2017" (Press release). ABC News Online via Scribd.com. 10 December 2013. Retrieved 11 December 2013. ↑ "Holden will cease operations in 2017". news.com.au. 11 December 2013. Retrieved 11 December 2013. ↑ "Holden to stop Australian manufacturing". afr.com. Retrieved 10 March 2015. ↑ "Exclusive: Dumarey confirms bid for Commodore and Elizabeth". Motoring.com.au. 21 December 2015. Retrieved 6 January 2016. ↑ Rohweder, Sarah (9 February 2016). "Doubts cast over Punch Corporation's Guido Dumarey Holden takeover bid". Northern Messenger. Retrieved 4 June 2016. ↑ Skulley, Mark (27 February 2016). "Belgian bid for Holden scrapped". The New Daily. Retrieved 25 June 2016. ↑ "Holden Facts" (PDF). GM Holden. November 2008. Retrieved 23 March 2010. 1 2 "Holden at a glance". GM Holden. Retrieved 23 March 2010. ↑ "HSV History & Background". Holden Special Vehicles. Archived from the original on 22 July 2005. ↑ "Toll and HSV Dealer Team confirm V8 Supercar alliance". HSV Dealer Team. 21 November 2005. Archived from the original on 16 October 2007. Retrieved 20 February 2008. ↑ Wright (2004), p. 152. ↑ "The Story of the Holden Lion". GM Holden. Archived from the original on 8 February 2008. 1 2 "Vehicle Exports". GM Holden. Retrieved 23 August 2008. ↑ Gover, Paul (1 May 2009). "Pontiac pays the price". Herald Sun. Retrieved 15 July 2009. ↑ Hammerton, Ron; Pettendy, Marton (13 July 2009). "Holden in US comeback". GoAuto. Retrieved 15 July 2009. ↑ "Very Last Holden Monaro Up For Auction". Motor1.com. 1 February 2006. Retrieved 20 January 2016. ↑ Pettendy, Marton (11 April 2007). "Holden's Chinese Buick". GoAuto. Retrieved 3 March 2008. ↑ Mathioudakis, Bryon (5 September 2008). "First look: Veritas a veritable Statesman". GoAuto. Retrieved 5 September 2008. ↑ "Financial Results 1998 – 2003". General Motors. Archived from the original on 21 July 2008. ↑ "Vauxhall VXR8 6.2 GTS". Autocar. 26 February 2011. Retrieved 17 January 2012. ↑ "Lowndes scores sixth Bathurst 1000 victory". Speedcafe. 11 October 2015. Retrieved 14 October 2015. Richards meanwhile picked up his fourth victory, handing Holden its 30th win on the mountain in the process. ↑ "Holden Chases 30th Bathurst Win". Holden. 9 October 2013. Retrieved 3 March 2014. Wikimedia Commons has media related to Holden. Ponchard, Nathan (November 2006). "At last, Holden finds a Seoul mate". Wheels. Sydney, New South Wales. Retrieved 23 August 2008.